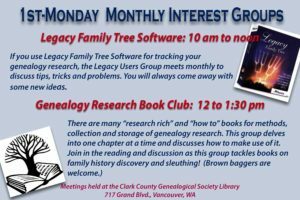 Clark County Genealogical Society, 717 Grand Blvd. Puzzled about where to look for information on an ancestor? How does one keep track of everything? Bring questions to this group for ideas. There's no meeting agenda, no special topic, just a group of curious people looking for help on their genealogy questions. 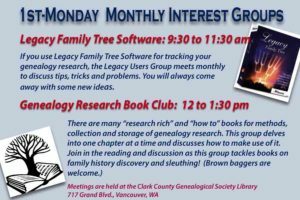 For those who use Legacy Family Tree Software to track genealogy research, there is a Legacy Users Group that meets monthly to discuss tips, tricks and problems. Meetings are held on the first Monday of the month. Members and nonmembers welcome. There are many “research rich” books of genealogical historical collections, as well as “how to” books on methods, collection and data storage of genealogy research. This group delves into one chapter at a time and discusses how to make the best use of it. 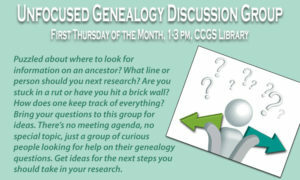 Join this casual group as they delve into their favorite topic of books on family history discovery and sleuthing. Brown baggers welcome. Participants will get tips for conducting research and finding cousins. Meet with other like-minded individuals who have discovered their ancestors going back many generations. Geographic areas include Norway, Sweden, Denmark, Finland, Iceland and the Faroe Islands. 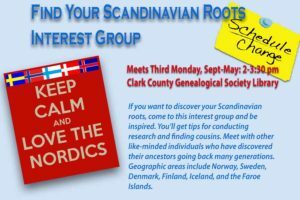 This monthly meeting will help people discover their Scandinavian roots. Meet with other like-minded individuals who have discovered their ancestors going back many generations. Geographic areas include Norway, Sweden, Denmark, Finland, Iceland and the Faroe Islands. This group meets regularly on the second Thursday of the month, September-May. Members and nonmembers are welcome.